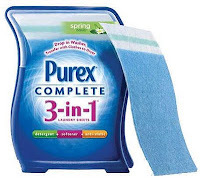 Go HERE to fill out a short form to receive a FREE 2 pack sample of Purex Complete 3-in-1 Laundry Sheets. Your free sample will arrive by mail in about 6-8 weeks. This sample is available for US households only with a limit of one per household, while supplies last.